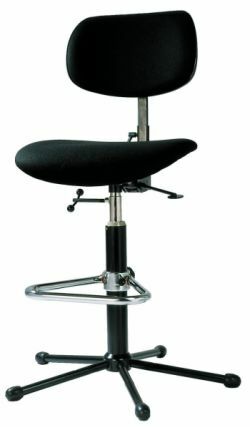 Our popular Whitebox3 Conductor's Chair features solid 5-legged base with height adjustable circular footrest and fully height adjustable seat. The upholstered curve-shaped backrest and waterfall seat design compliments our Musician Chair and provides longlasting comfort during long rehearsals and performances. Superb five-legged star base, chrome triangle footrest, seat height adjustment (position-tilting seat possible), laminated beech veneered seat & back (or upholstered seat with rubber-fibre material - better than foam! 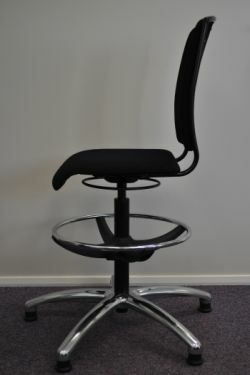 ), swivel seat, height/angle adjustable backrest. Attractive four-legged frame of tubular steel available in black or chrome. Laminated beech veneer seat and back (or upholstered seat featuring rubber-fibre seat for better comfort).